Quality, performance, Innovation, customer service and Industry leading warranty is what makes Predator Hunter Outdoors stand out above the rest! NEW! 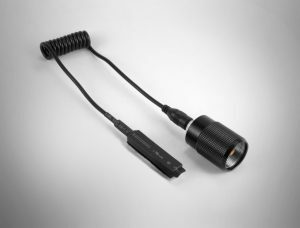 For 2018, Predator Hunter Outdoors is excited to announce the release of our all new Adjustable Beam NS550 EXTREME distance line of predator hunting lights! After many hours and months of engineering and testing, we have perfected the ultimate hunting light. There really is nothing quite like it! 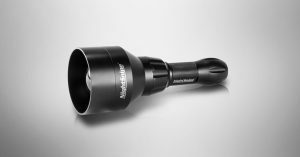 Some professionals in the industry have called it the Cadillac of predator hunting lights because of its attention to detail, extremely tight fit, fluid-like adjustments, light weight and compact size, all while reaching extreme light distances. Pick one and compare it to the competition. You will quickly see why the new NS550 EXTREME has gone above and beyond what others have done! Coyotes, fox, bobcats, hogs, raccoons, or any other prey you’re after don’t stand a chance with the NS550 EXTREME after the sun goes down!!! Designed, tested and engineered by predator hunters for predator hunters! Precisely engineered adjustable beam focus bezel allows adjustments for flood or extremely tight, pin point beam placement. 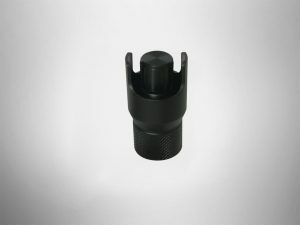 1 – Turn rotation allows for quick flood / focus beam adjustments. 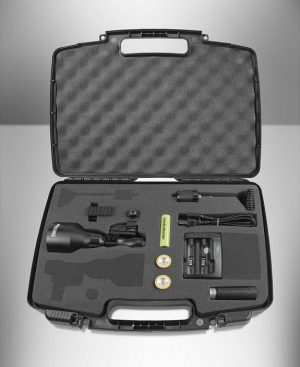 Interchangeable (100,000 hours) American made CREE LED available in red, green, white OR (IR) Infrared for night vision hunters. Change LED colors in less than 30 seconds. 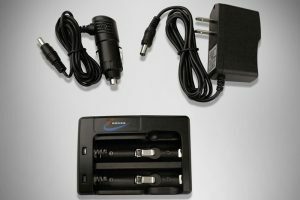 Available in 1 (HIGH) or 2 (LOW / HIGH) mode LEDs. 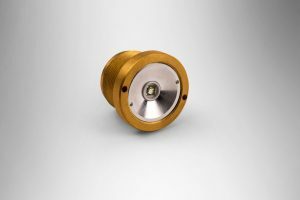 Light and CREE LEDs manufactured under an ISO9001 certified manufacturer for consistent engineering and reliability. 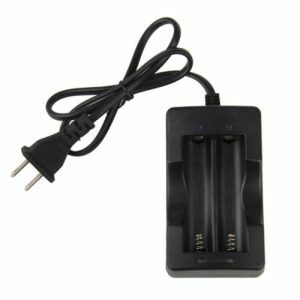 Battery extender allows for use of 1 or 2 batteries. Constructed of aircraft grade T-6 aluminum with type III hard adonization for heavy impact and recoil resistance. 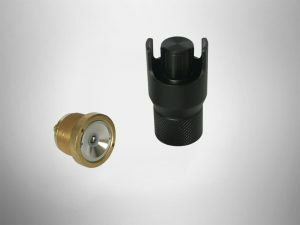 Heavy duty plug with screw in coiled (pressure) or (click) switch. Precisely designed convex glass lens to achieve the highest light magnification possible. 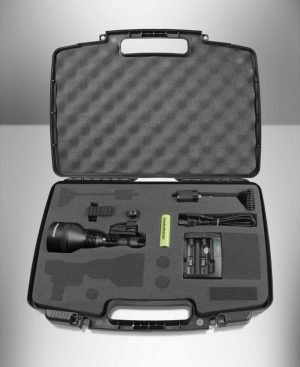 Built in halo shield allows for less light spill and maintains a focused beam. Low profile, finely tuned adjustable mount system that allows for precise and accurate beam placement. Weighing in at just over 15oz and measuring just over 7”. Tested, designed, serviced and warrantied in the USA. Industry leading 5-YEAR LIMITED WARRANTY. When we say that fine detail was taken in the making of the new NS550 EXTREME, we are not exaggerating! After close examination of our current fixed beam lights and other predator hunting lights in the market, we noticed that there was plenty of room for improvements in a number of different areas starting with the overall build. 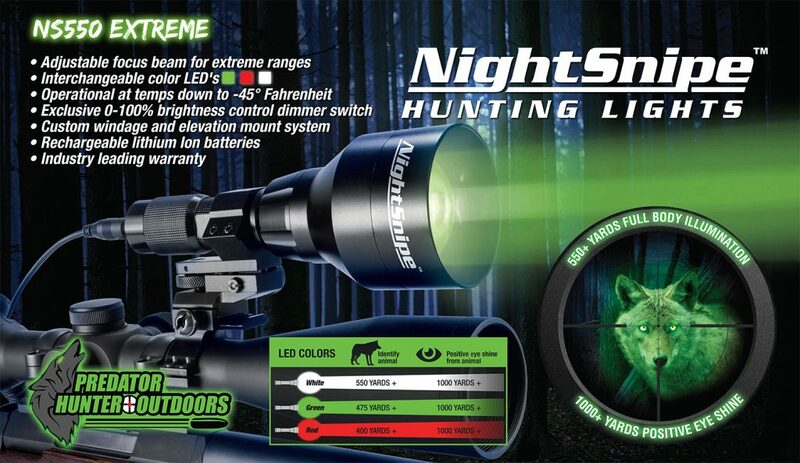 Weight: The new NS550 EXTREME is smaller, more compact and lighter then other predator hunting lights in its class. Carrying around a heavy, bulky light on your weapon is not ideal or preferred by most predator hunters. We beefed up stress points and thinned out areas where less material was needed to make the NS550 EXTREME as light as possible. In doing this, we were also able to keep the size of the light compact and less bulky. Design and Engineering: Built like a Cadillac! Attention to detail, extremely tight fit, fluid like adjustments make the new NS550 EXTREME a leader in its class! Adjustable beam lights are judged in a number of ways and one of the most important is the fluidity and stabilization of the bezel adjustment AND tightness of the overall bezel. Having a sloppy bezel at any stage of adjustment makes for a less effective light and much harder to keep your tightly focused beam on target with precision. Just like sighting in a scope, you may only move your adjustment 1/8 of an inch, but by the time it reaches the intended target the movement is major. Take that 1/8 of an inch down 100 yards and you will be off target by a number of feet! Focus Adjustment: Quick, Precise, Fluid-like Adjustments is what the NS550 EXTREME Produces. Full ranges of beam focus adjustment (flood to fully tight focus) in 1 full turn of the bezel. 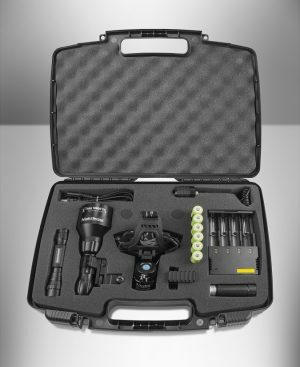 This allows for very quick, precise adjustments of your lights beam for each specific situation as the action goes down. 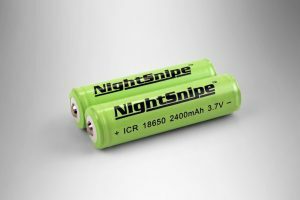 LED and Electrical Components: The Heart of The Light – The Internal Components. 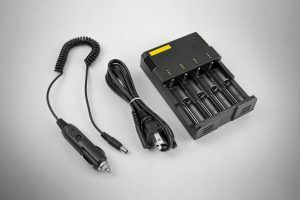 These are the parts that can make or break a light’s performance and reliability. We have, and will continue to use, American made CREE brand LEDs for their quality, longevity, reliability and light consistency. We have also achieved maximum output using the highest quality circuitry and drivers that power these LEDs, making them the brightest possible. Glass Lens Quality: Low Quality Glass Gives Low Quality Results. Another important aspect in a light’s performance is the quality of glass used. This is not a concern when dealing with NON – focusable beam light like the NightSnipe Fixed beam lights. However, in a focusable beam light like the NS550 EXTREME , the glass quality plays a significant role in the overall performance. The new NS550 uses the highest quality glass with the tightest porous standards to ensure maximum magnification and down range performance. Adjustable Mount System: Just like mounting a rifle scope, keeping your light as close as possible to your scope / weapon is crucial for maximum performance. 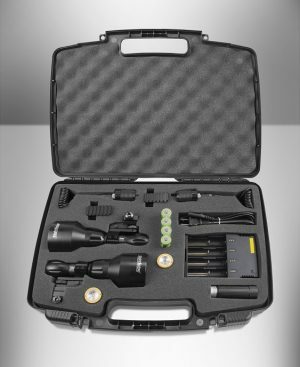 Having too high of a mount will result in improper beam placement and insufficient adjustments that will not allow your tightly focused light beam to be centered in your scope and on your intended target. 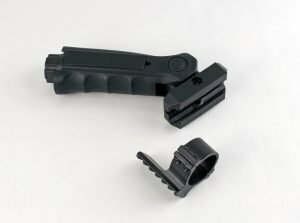 In addition to improper beam placement or lack of overall adjustment, the adjustment knobs on 99% of similar mounts are too small and become seized up very quickly leaving you with a now nonadjustable mount. A great majority of the adjustable mounts available on the market are very low quality builds. They lack precise CNC machining, quality internal components such as springs, ball bearings and other crucial parts that make up the mounts. We have also found that most of the mounts do not fit the light tubes properly due to improper hole / screw placement, hole depth and sloppy engineering of the mount ring. We engineered our adjustable mounts in the same fashion as our lights; tight, fluid-like and precise adjustments for pinpoint accuracy. Not only did we improve the overall CNC machining of the mounts, we also increased the ball bearing diameters, springs and travel adjustments to ensure a full range of adjustment both vertically and horizontally. Custom Flambeau Hard Case: Your hunting light is an investment that you want to protect for years to come. All of our hunting lights and headlamp kits come with custom foam cutout hard cases designed for Predator Hunter Outdoors by Flambeau Corporation. Each component of our hunting light kits has its own foam cutout specific for that intended part. You can rest assured that your accessories will be protected and there when you need them. Another important feature we included in our custom boxes was the placement of the light with mount still attached. 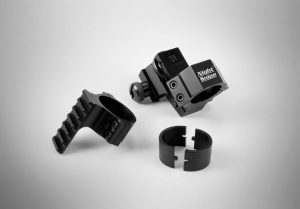 Attaching or removing your adjustable mount from your light is something you do not want to have to do after each hunt. It’s not practical, takes time, requires an allen wrench for the removal of 4 small screws that are sure to get lost in the dark. We designed our new Adjustable beam light boxes with a custom foam cutout for your light with the mount still attached! Remove your mount from your rail in 3 seconds and place it in your case. It’s that quick! Simple, quick, fully protected and ready in seconds for the next set / hunt. It just does not get any easier! 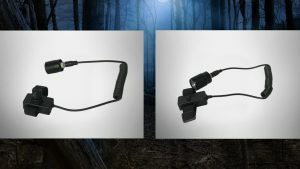 LED Choices: As stated before, Predator Hunter Outdoors uses the highest quality materials in all of our products. When it comes to the brand of LED, we continue with that same mindset that only the best will do. Therefore, we use the American made, 100,000 hour rated CREE LEDs. They perform the best, last the longest and have the most consistent light output of all LED brands. (2 mode low / high). Predator hunting at night is many times very fast paced with a lot of variables coming into play. Most know what “buck fever” is. The heart rate accelerates, the body and mind are not in full tune with one another; mistakes happen. This also happens to predator hunters. Operating a call, having your gun positioned properly, trying to stop the game with a clear shot, having your scope in focus, and having your light beam at the desired focus are just a few things that come into play. Quick shot placement is crucial and keeping your LED mode options to a minimum is a must. The last thing you need are too many modes to cause more confusion. More than two modes is just adds to the confusion and is unnecessary. Example: You flip your light on and it is in the wrong mode, the predator is at 75 yards and the light is just too bright, you try to bump your switch lightly to switch modes and you accidentally click the switch too hard and shut the light off. Now you have to click it back on, find the predator again, try and find the right mode, get the predator to stop in a clearing, and then hopefully have time to take the shot. You can see where this is going. In most cases that predator goes on to live another day. Turning your light on and having the ability to instantly take the shot or flip to high mode is not only quick, but it is simple and the most effective. It allows you to focus on the main goal of proper shot placement and putting the predator down. Warranty and Customer Service: Industry Leading 5-Year Limited Warranty. Anyone who has dealt with Predator Hunter Outdoors knows that our customer service is some of the best in the industry. We stand behind our products 110% and do everything we can to help our customers with whatever it may be. You will always speak with a knowledgeable, competent employee who not only uses the product, but knows it like the back of their hand. We treat our customers how we would want to be treated ourselves. With that mentality in mind, you will be assured to not only get the highest quality products, but also the highest quality customer service.